Padua is an Italian city often overlooked by its famous neighbors (Venice and Verona, to name a few) but is a destination in its own right — full of history, culture, and art. 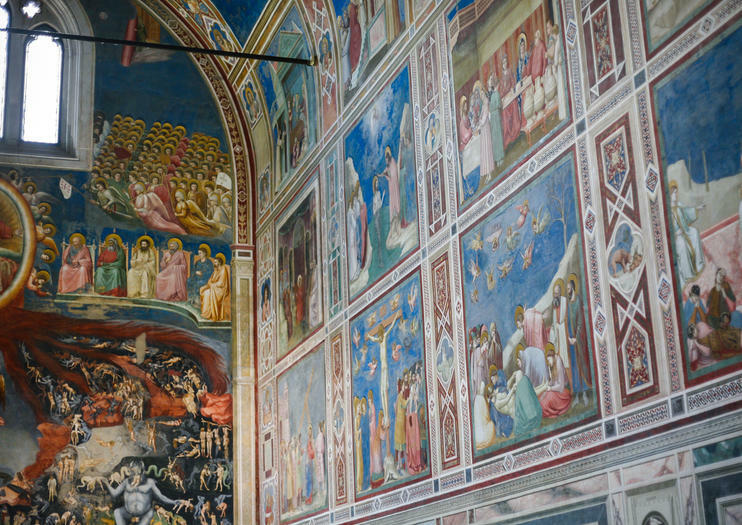 The Scrovegni Chapel is perhaps its best example of this, with an exquisite fresco cycle by Giotto that dates back to the early 14th century. The work is widely considered a masterpiece of Western art. Decorated with ornate biblical scenes, mostly depicting the lives of Mary and Jesus, the colors and detail are well preserved — having undergone extensive renovations in the 19th and 20th centuries. There are also allegorical depictions of the Vices and Virtues. Only 25 people at a time are allowed into the rooms which contain the works, and they are situated in tightly-controlled micro climates. Scenes are displayed chronologically, with special attention paid to facial expressions of those surrounding key figures. Look closely at the shading and placement of light as well, often leading the eye to where it is intended to focus. The masterful work, which has delighted observers for more than seven centuries, is an excellent example of storytelling through visual art. Reservations to see the frescoes must be made in advance. Tickets can be purchased online and cannot be sold same day. Visitors will have access to an air-conditioned waiting room prior to entering the rooms, in order to properly acclimate. Tickets are €13 on their own, or included with a purchase of the Padova Card. Visits are scheduled for either 15 or 20 minutes. This 4-hour private tour together with an expert local guide allows you to discover this wonderful historical city in the best way possible. Meet your local guide in Prato della Valle, one of the biggest Squares of the City and immerse yourself in the art and culture of the City of the Saint. You will have the privilege to admire the famous Sant Antonio Basilica, a religious symbol of the city where are the remains of the Saint that welcomes tourists every year on pilgrimage, especially on June 13, the day dedicated to the Saint and the incomparable Scrovegni Chapel which contains masterpieces by Giotto.In the historical center you will cross important commercial squares such as Piazza delle Erbe and Piazza della Frutta where you will admire Palazzo della Ragione, ancient seat of the city's courts.Then on, one of the oldest Italian universities which hosts a famous Botanical Garden up to the very famous and ancient Caffe Pedrocchi. Take the train from Venice to Padua for a day of exploring with this tour. Visit St. Anthony’s Basilica (Basilica of St Anthony), Scrovegni Chapel, and one of Italy’s largest public squares, Prato della Valle. Plus, see the medieval town hall, Palazzo della Ragione. If you choose, you can stay in Padua longer, and go to the Zuckermann Palace or the Eremitani Civic Museum—both entrance fees are included with this tour.